Written by William on September 28, 2011 and posted in Uncategorized. So the time is upon us to play another Zelda game. This time it’s free! 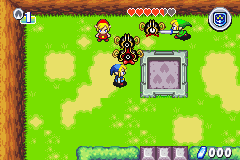 If you have a DSi, DSiXL or 3DS you can download The legend of Zelda: Four Swords on the store. It’s DSi Ware so no 3D for us 3DS owners but that doesn’t matter because it’s a free game. It’s a game initially released on the Gamecube and GBA but the new 25th Anniversary Edition boasts an updated single player mode with extra levels and area plus it has a completely revamped connection system for the multi-player, it’s now all handled wirelessly. It’s free from 28th November 2011 until February 20th 2012 but don’t wait, grab your DSi/DSiXL/3DS and start downloading now!